OMG that bag! The colour is just divine and making me yearn to add this colour to my wardrobe. I love it paired with both maxi dresses, it compliments them beautifully. Wow i love maxi dress. It looks nice on you esp the blue one. Oh wow I love this boho collection, so pretty!! 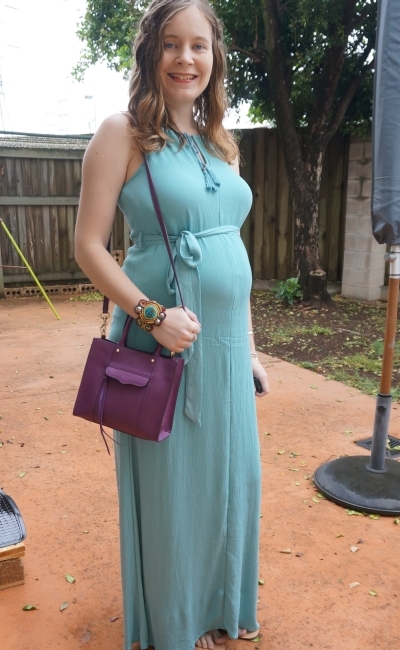 Wish it was summer here, the purple Gigi dress you are wearing is beautiful and you look great with your cute baby bump. Love the bracelet on the first photo! Very pretty! Love that Rebecca bag! The color is perfect for fall. wow, those maxi dresses are so feminine and beautiful.....perfect maternity looks! You are a vision of beauty and elegance in both of these outfits...and that purple bag is so lovely. These look so lovely and can I just say, I love you bag! If I ever see a bag that color and style from the malls near where I live, I would definitely get it! I highly recommend it! Rebecca Minkoff often has sales online too! Yep, it's that kind of lightweight, great for summer but not so great for creasing fabric haha! That pretty plum Minkoff works so well with both these looks! I saw these while in Jeanswest the other day and thought of you!! I'm heading back there to take advantage of the members sale and to scoop up a few of their basic camis etc. I've posted about some of their maternity wear today, such a good deal! They have the best basics at Jeanswest! I'm so glad your friend could start off her maternity wardrobe there too! I'm loving being back in my Jeanswest maternity denim now Frocktober is over. While I don't consider my style to be bohemian, I am always drawn to the style! I love the dresses you chose, especially that mint green shade. It's a style I really like too, although I wouldn't classify everything I wear as boho either! omg! you are ravishing in both dresses!!! sooo pretty, dear! The color of the first dress, and then the print of the second, are just so lovely! Perfect for warm weather! They are both great dresses! Even better when they are 40% off too! Those dresses look gorgeous on you! Your baby bump is just darling! Perfect dress for a bump! I love the style of both dresses but my favourite would be the eggshell one - it is one of my favourite colours. that dress is so pretty! and I LOVE that bag! Both of these dresses are so beautiful! I love the blue colour of the first one, and the pattern on the second is amazing. That bag is a stunner too! These dresses look so pretty on you! Love the bag! What a nice color! That is a truly beautiful color combination! (And I love how that shade of blue/green is echoed in the pool behind you!) Purple is my favorite color so naturally I am in love with that handbag. Love your curled hair in these photos, too. Very pretty! It would be! I'm hoping I can find an event to wear it too and manage to squeeze the bump into it one more time! I love both dresses. The style of them are perfect on you Mica. Great color and print. These dresses are stunning on you! 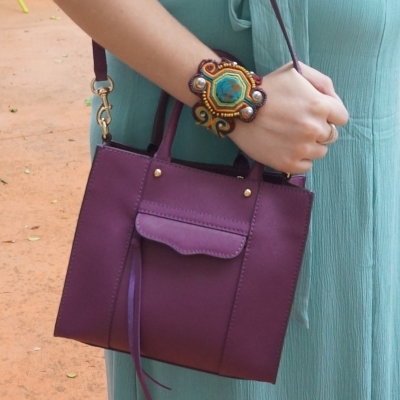 The color combination with your bag in the first outfit works beautifully! 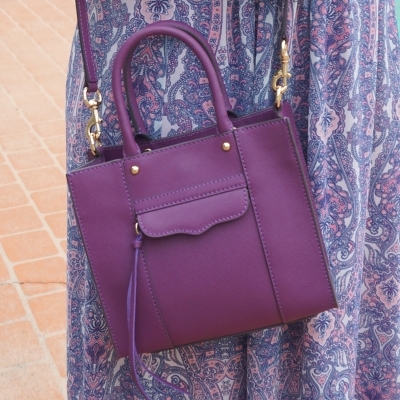 I looove the purple handbag with both maxi dresses! Purple is my favorite color but for some reason I never wear it. I'm thinking I might need to add a purple bag to my closet now! I really missed my purple bag after I sold my Balenciaga city, I'm so glad to have got this one, definitely was a gap in my wardrobe! Both of your maxi dresses are so pretty! Love the colors! I'm obsessing over that plum bag! I have heard great things about Jeanswest and with your style, the boho collection suits you Mica. You picked out two lovely Maxi Dresses. They both beautifully show off your baby bump too. The dresses are lovely. Do you know if it's a boy or a girl yet? Love both dresses, but the second one might be my fav! Both great dresses! I love your fun bracelet with the first dress. Beautiful pieces you selected there, in love with those bags. You're looking fabulous and I love both the dresses on you, but Gigi is my favourite! I wish I was tall enough to wear maxi dresses! Maxi dresses are a beautiful pairing with a bump. Jeans West have some gorgeous items out at the moment. You look great in this blue, so pretty and I am so tempted with the RM sale right now!